Documentation that the Clean Air Act of 1970 and its subsequent amendments are working continues to mount. For agriculture, the reduction of sulfur dioxide emissions into the atmosphere is translating to less sulfur being deposited to fields in the form of rainfall. 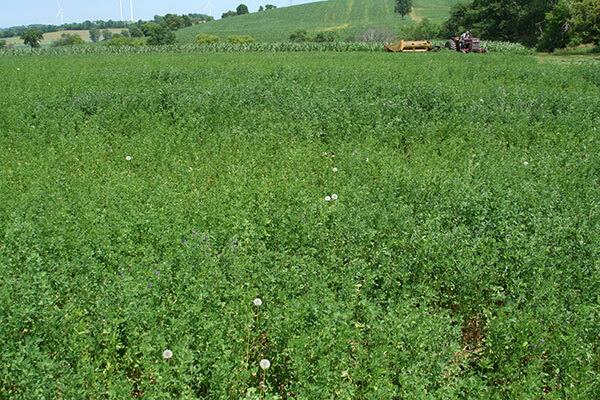 Kaatz recently reported results of a 2015 statewide survey looking at the sulfur status of alfalfa. Plant tissue samples were collected from fields located across the state. A total of 52 samples were analyzed from second, third and fourth cuttings. Sulfur deficiency is most prominent after the initial spring harvest. Of the tested samples, 38 percent were found to be deficient in sulfur; deficiency was defined as less than 0.25 percent. Another 14 percent of the samples fell into a range that was barely adequate (0.25 to 0.27 percent sulfur). Only 8 percent of the samples tested in the high range (>0.50 percent). The greatest concentration of deficient fields was found in the Upper Peninsula and northern regions, where 58 percent of the samples fell below adequate levels. “Sandy soils are more prominent in this part of the state,” notes Kaatz. 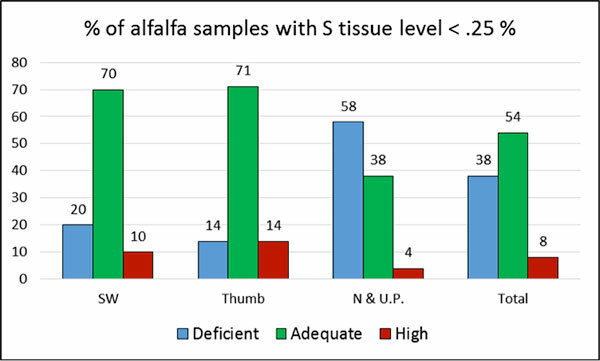 In the Thumb region, where the lowest percent of deficient samples were found, soils are finer textured and routine manure applications are more common. The Michigan State sulfur survey complements a similar Wisconsin study that was done in 2010 and 2011. In the Badger State, 62 percent of the 73 surveyed fields were found to be deficient in sulfur. Plant samples were taken just prior to first or second cutting and from fields with no manure or sulfur application in the 12 months prior to tissue sampling. Interestingly, many of the fields that were found to be deficient did not show visible symptoms. Sulfur deficiency can drastically cut into forage yield and quality; however, it’s an easy problem to correct. “Plants take up the sulfate form of sulfur, so applying 25 pounds of sulfate-sulfur per acre will remedy the deficiency,” says Kaatz. There are several sulfate-containing fertilizers available, including gypsum. Irrigation water may also be a source of sulfur, but will vary based on location. Although sulfur deficiency is becoming an increasing problem, it’s also important to note that not every alfalfa field is deficient. Complicating the issue is that a soil test for sulfur is not definitive as the nutrient status can change throughout the growing season. The best approach is taking both a soil and plant tissue sample. Contact your preferred laboratory for recommended sampling procedures. It seems that more and more growers are applying sulfur to alfalfa on an annual basis. Though this approach ensures sufficiency, it may not always offer the best economic return.